Hello again. You might have noticed that things were a little quiet here last week. Hopefully, the chocolate recipes I posted before I left filled the void while I went off to play in Colorado. My husband’s clan gets together every couple of years for a reunion and we stay at the YMCA of the Rockies in Estes Park. It is a great location that can accommodate large groups (we had 33 people this year) with hiking trails, gorgeous views of the mountains, and activities galore. We hiked. We zip-lined. We went white-water rafting. We competed viciously (in a good way, I think) in family games. And we bought peaches. Yes, that’s right, I am highlighting buying peaches. In Colorado. I never knew that peaches could even be grown in Colorado until Gourmet Magazine published an article ten years ago that featured peaches from Palisade. We happen to read the article right before we left for a family vacation in Vail so we decided to spend a day driving to Palisade to visit an orchard. Not to be overly dramatic but they were the best peaches I had ever tasted. Of course, the peaches had just been picked moments before and were at the peak of ripeness but it was the incredible sweetness that really struck me. I haven’t been able to buy a non-Palisade peach since. Fortunately, we have family reunions in Colorado right around the time Palisade peaches are harvested so I can get my peach fix every couple of years. We make a special effort to visit the farmer’s market in Boulder where our favorite orchard sells its peaches to the public. We are huge fans of Morton’s Orchards and given how quickly they sell out, we are not alone. This year we bought 36 pounds of peaches, packed them in our bulging suitcases and flew back to Texas with them. So, to kick off my personal peach festival, I decided to share this recipe for a warm peach and prosciutto salad. 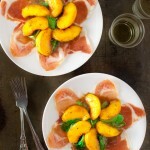 The saltiness of the prosciutto, sweetness of the peaches, and peppery flavor of the arugula go very nicely together. It is a great way to start a summer meal. Disclosure: I did not receive any kind of compensation from Morton’s Orchards. I simply mentioned them because I truly do love their peaches. Cut the prosciutto slices in half crosswise and arrange them in a fan on 4 salad plates, dividing them equally. Put the cut peaches in a bowl and season with salt and pepper. Melt the butter in a large skillet over medium heat. When the butter just begins to brown, add the bay leaf, thyme, peaches, and balsamic vinegar. Gently stir for about 1 minute. Taste and adjust salt and pepper as desired. Remove and discard the bay leaf. Remove pan from the heat, add the arugula, and toss with tongs until the arugula wilts just slightly. Divide the arugula and peaches among the 4 plates and serve immediately. Recipe adapted from Michael Chiarello’s Casual Cooking cookbook.